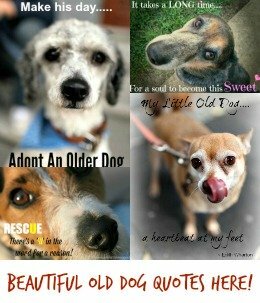 Older dog heart problems are fairly common, and your senior dog is quite likely to develop some type of heart disease…. eventually. This is because although the heart is a very complex organ, it IS just an organ, and as your dog grows older his body won’t function as well as it used to. This includes his major organs such as the heart, liver and kidneys. But if you’re worried about witnessing a sudden dog heart attack, don’t be. Dogs generally don’t have ‘heart attacks’ the way people do. They also don’t have problems with their cholesterol levels or blood pressure (unless they’re in heart failure). That’s the good news. But heart disease can, and does, happen to dogs, just the way it does to people. Luckily, when symptoms of degenerative canine heart disease are spotted early, they can often be treated or managed, so that Fido gets to spend more time enjoying his life with you. And although dog heart attacks are rare, occasionally a Myocardial Infarction (the correct medical terminology for a heart attack) can happen, so I’ve also included a short section on the symptoms, diaganosis and treatment of a dog heart attack. Dog heart valve problems are the most common type of canine heart disease. Studies indicate that between 30% and 75% of senior dogs will develop Mitral Valve Disease (also known as MVD). Also, smaller dogs, and certain breeds, have an increased risk of experiencing this problem. The aging process naturally causes your dog’s organs and systems to deteriorate, and including the valves which keep his heart pumping properly. The heart muscles and valves get thicker, and less elastic, which means they can’t contract as strongly as they used to. When this happens blood starts to leak backwards into the chamber of his heart called the ‘left atrium’. When it does this regularly, that chamber becomes enlarged. That in turn puts extra strain on the heart valves, and it becomes a vicious circle. If it’s left untreated, valve disease like this can become canine congestive heart failure, so early detection and treatment is really important. The very first symptom of this condition is a heart murmur. Although heart murmurs in puppies and adult dogs can be caused by other issues, the sudden appearance of a heart murmur in an older adult dog (who has never had this problem before) is most likely going to be due to a faulty valve. This isn’t something that you can see, so if your dog isn’t getting regular veterinary check-ups it can go un-noticed until the problem is severe enough to cause other symptoms. Annual veterinary check-ups can make sure any older dog heart problems are picked up early and are treated properly to minimize any damage! If it’s left untreated, more symptoms will start to appear – and these ones you will be able to see. But, sometimes the symptoms of older dog heart problems come on slowly, over a period of time, are mild enough not to raise a red flag early on, or are confused with symptoms of another condition. The longer your dog has weak or faulty heart valves, the more damage is being done to his heart, and the lower his chances of the condition being treated successfully. Coughing (especially after exercise or after waking up in the morning). If your dog is diagnosed with valve disease while it’s still in the very early stages (ie found at the heart-murmur stage), he may not need any immediate treatment if he seems healthy otherwise. Annual, or bi-annual check-ups, and either x-rays or an echo-cardiogram every year or two will let your veterinarian monitor his condition and step in as soon as necessary. When it’s got to the point where your vet feels it’s necessary to start treating older dog heart problems like this, there are several medications that can help keep Fido’s heart functioning properly. This will prevent, or reduce, any symptoms he’s having and can often also slow down the rate at which the condition would normally advance. A normal dog heart beats faster than the human heart does… and the smaller your dog, the more rapidly his heart is going to beat. Every dog is a little different and general health, normal activity level and other things can factor in. But here are some guidelines for the average ‘resting’ normal dog heart rate figures, (measured in beats per minute)….. The end result of mitral heart valve disease in older dogs is congestive heart failure. This is just the natural progression of the condition. Your senior dog’s heart has been pumping hard his whole life, and the wear-and-tear of those years isn’t reversible. It is nature taking it’s course. According to the American Veterinary Medical Association, 60% of senior dogs are at risk of developing Canine Heart Failure. 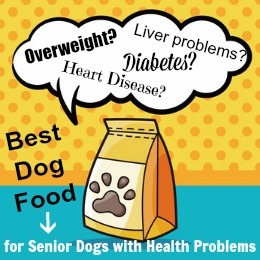 The good news is that medication and the right care can definitely slow down the progress of older dog heart problems, if the condition is caught early enough. Plus treatment will make your dog feel much better and improve the quality of his life. The symptoms of congestive heart failure in dogs include many of the more serious symptoms of mitral valve disease. When your veterinarian examines your dog he will be able to hear the unusual blood flow through the heart, and may also notice an irregular heartbeat. An X-ray, ECG or an ultrasound exam will show the physical signs of older dog heart disease such as the enlarged heart chambers. The earlier treatment is started, the better the prognosis for your dog because the damage done to his heart will be minimized. There are a few different drugs that your veterinarian might prescribe to treat your older dog if he is diagnosed with valve disease or heart failure. Positive Inotropes – this type of drug helps to strengthen the heart muscles to improve contractions. * Digitalis drugs are less likely to be used now than they used to be, because of concerns over potential side-effects. Although they’re not a treatment, and shouldn’t replace your veterinarian’s recommendations, natural supplements can also be used to give your dog’s heart the maximum amount of help. These include amino acids such as L-Carnitine and Taurine, anti-oxidants like CoQ10, and Omega-3 fish oils. Lifestyle and/or dietary changes can also play a role in caring for an older dog with heart problems. Sometimes owners think their dog has had a heart attack because they die suddenly, and there are no other obvious causes. What’s more likely is that Mitral Valve Disease (MVD) or the resulting Congestive Heart Failure are really to blame. But if the condition has gone unnoticed, and without an autopsy, it seems as though a heart attack is to blame. A heart attack happens when one of the coronary arteries becomes clogged or blocked by plaque or other debris, reducing (or occasionally even cutting off) the hearts’ blood supply. The symptoms of a heart attack in dogs are very similar to those of MVD or heart failure. Sadly, the first sign of a heart attack in dogs is sudden death, this can also be true of canine heart failure. Having owned a Rottweiler who died out of the blue from a heart condition, and an Olde English Bulldogge puppy who died tragically and unexpectedly from what an autopsy concluded was a heart problem, I know first hand the terror and heartbreak of being in this situation. However, if you (and your dog) are fortunate enough for his heart attack to NOT be instantly fatal, then getting him immediate veterinary care just might save his life. Your veterinarian has a slew of tests that he can perform to find out what’s happening inside your pets’ heart (as well as to look for underlying disease that could be causing/contributing to the problem). These will help him to decide what treatment is the best option. These tests might include a full physical exam, blood tests, urinalysis (testing his urine, an ECG, X-rays and ultrasound exams. Treatment options will obviously depend on the reason for the symptoms (which might well not be caused by a heart attack at all), his age and his general health. He will be admitted to the veterinary hospital and given resuscitation if needed, as well as IV fluids or any emergency medications that your vet deems necessary. Once he’s stable, he will most likely be prescribed medications to break up blood clots (if there are any), or to regulate his heart rhythm or blood flow. Whether or not he has to stay in the vet hospital for a while will depend entirely on the individual circumstances and his condition. Even once released to go home, a dog with heart problems will need to be closely (and regularly) monitored by his veterinarian, and most likely take medications for the rest of his life. It’s impossible to give a definitive answer to the question of how long a dog can live with heart disease. That’s because a lot depends on the type/cause of the heart problems, as well as how early they’re diagnosed. If dog heart valve problems are spotted at the very early ‘heart murmur stage’, and monitored carefully, then it’s perfectly possible for him to live with it for years. But if your dog isn’t diagnosed until he’s showing symptoms of congestive heart failure then more damage has already been done…. …. and the time he has left is obviously going to be shorter. Quality of life is something else you have to factor into the equation. While a dog in late-stage heart failure may physically be able to continue to breathe, he may be in a lot of pain or discomfort , as well as having difficulty breathing and possibly feeling anxious. Plus he won’t be able to enjoy much, if anything, about his daily life. So is that really living? BUT, the drugs used to control and treat older dog heart problems can be effective, in giving him more time as well as improving his quality of life. 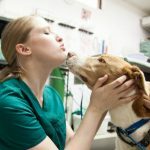 Your veterinarian is the best person to talk to about your dog’s prognosis as he/she knows the symptoms, damage, treatment options and so on that are unique to him. My chihuahua mix has a heart murmur. He has had four fainting spells that I know of since May 6, 2018. He had one today and was not sure he was going to recover. Took Pepe (my dog) to Vet Monday. Dr checked him out and gave him medications which he will not take and no way I can get him to take. My old arthritic hands try but I had to give up. Dr had give Etmedin but cannot give. So will he just finally die from fainting? He wasflund loose and could not find owner, so do not know age, but Vet said approximate age 14 years. Weighs 10 lbs. Hard to get him to eat. He sleeps a lot. I have a small Chihuahua cross on Vetmedin pills plus a diuretic. I found the easiest way to get her to eat them was to buy something called Pill Pockets. They’re basically just soft dog treats that you can mold around the pill like Silly Putty. I cut the pill capsule in half (the powder inside is a little less than half those giant caps) and use maybe a quarter of each Pill Pocket to seal it up. She gobbles them up like a treat! I give my dog his medication hidden with NO SALT peanut butter on a teaspoon and he eats it no problems. I have a 17 year old shitzu. She still has quite an appetite, playful bursts, and wags her little tail in delight all day. However, she has developed a horrible cough. She acts as though something will come up with her hacks, but nothing really does. Her coughing fits will last a few minutes then she seems tuckered out and will sleep. Anything I can do for her? This is the exact problem my 14 year old yorkie has developed. shes been to the vets today and they think its a heart problem, she has to have blood tests anda scan next week. Hopefully you will see this message. My dog, a toy poodle, named Pepe as well turns 10 years old on September 11th. Three years ago he was diagnosed with a heart murmur and a heart that was beginning to enlarge. I too had the same problem Pepe wasn’t having anything to do with taking a pill . My hands are better than yours, so I tried everything to get them down mix with something he likes. Didn’t work he spit the pills out and ate the food. I even went to the point of forcing them down him. Of course then it made it worse and he would hide the pills in his cheeks and spit them out when I wasn’t looking. As a pharmacist, I scratched my head and it hit me why not turn it into a powder with a mortar and pestle. Even with arthritic hands you could probably do this as long as it’s safe to crush the meds the dog is given. (Human furosemide, Enalapril and Zyrtec are fine, I get them from the pharmacy because it’s cheaper for me that way). For other meds want to ask vet. Next take the powder and pour it in the dogs favorite treat and mix it up. For Pepe Caesar meals is what I used. It worked perfectly he would gobble it down in a second and I have done that since he was diagnosed. The dog that was hacking all the time and sleeping almost all the time. Suddenly stopped hacking and would chase the other dogs again. You might try this idea it worked for me. A few months later he had an X-ray. The vet come in looked at me and said you need to see this X-ray. She took me back and said this was his X-ray 6 months ago his heart is enlarged and beginning to develop heart failure then switched X-rays and said this is now his heart it has shrunk back to normal. Looking at the X-rays it looked like his heart had shrank 10-15 percent. The vet said this is very rare for something like this to happen. I told the vet he hasn’t missed a single dose and since I compound his meds now (simply use mortar and pestle to grind pills to a powder) I know he isn’t spitting them back up. We decided to keep giving him his meds and not change anything. It’s been around 2.5 years since then, I took him to the vet last week because he was hacking a little more often than normal and was unsure if his problem was allergies(pollen counts really high here) or a worsening of his heart. Pepe goes to a different vet now than before, during his visit the vet had mentioned most dogs with heart murmurs like Pepe pass away in 18-24 months after noting he has a noticeable heart murmur now then moving on to checking his lungs and then said his lungs are clear. Must be allergies. It’s 3 years later and Pepe is living a happy active life, granted with his condition at any moment he could take a turn for the worse. I was where you was I was close to giving up and I was physically able to shove the pill down the dogs throat and doing it Day after day and he was still spitting them up. Putting the whole pills in Vienna sausages, caesar meals, stuff you buy to disguise pill inside didn’t work, grinding meds that could be crushed into a powder worked. Hopefully this is beneficial to you Connie or someone else having the same problem. My Rat Terrier Oreo was diagnosed with CHF at the end of August. He’s on the standard heart meds and are working great, like a new dog!! His appetite has all but gone away, though. I have a really hard time getting him to eat, even his old favorites. Except for taking his meds! I started getting baby food. YES, baby food! The little jars of meats, Oreo LOVES the ham flavor, it’s like dog crack to him!! I put a tiny bit on a spoon, his pill and he licks it right up!! Try meds in that. I don’t even have to crush the pills, they are quite small, you can cut them if yours are bigger. I’m going to try other flavors but still keep the ham flavor just in case!! Hope this helps! Alan, I’m going to try what you have done. I have a 12 year old mini schnauzer/chihuahua mix who has an enlarged heart because of a heart murmur. Just recently he seems to have a difficult time getting into a comfortable position to sleep. I have only had him 2 years as he is a rescue dog with a hard history. I want to give him the best life possible, he deserves it. Thank-you for sharing. I have a Havanese,14 he has a significant heart murmur as the vet said. He doesn’t cough, but is sleeping more, not running and playing as much, eating well, but today he has seemed disoriented and had a very difficult time settling down. The vet did not suggest any medication. Should he be taking something? I am on a fixed income and cannot afford a lot of tests. What can I do? I am not a vet. Just a pharmacist. I am not the author of this article either but wanted to share what I know Incase it helps you in some way. I can’t clearly remember Pepe’s first visit when he initially was discovered to have a heart murmur. His was stage 1 and the vet said it was likely even a cardiologist wouldn’t notice it. It was several years ago now, however I am pretty sure he did get medicine initially but he had an x ray to look at his heart. It was enlarged. The vet insisted he should get meds because the heart murmur would progress the enlarged heart into heart failure and this would slow that progress. The meds would improve the sleeping and not running and playing much that you mentioned. He would hide under the bed to not be bothered by my toy schnauzer. Pepe did also have coughing unlike your dog. Pepe did not appear disoriented as you mentioned your dog has. It’s possible it could have been another issue. He first received furosemide, with a prescription I can get it at Walmart for $4 for a 30 day supply. Granted I have to split his pills to get the right dose then I compound them after that as described in earlier post because he won’t take pills but it’s cheaper than getting meds at vet and are the meds humans take and can get them in a pharmacy. His enalapril which was added later was around $14 with a prescription discount card. So his meds are under $20 a month. However, You haven’t mentioned an X-ray and at a city vet they are expensive and I can understand someone on a fixed income having trouble paying for it. So if vet didn’t get X-ray then all the vet knows is dog has heart murmur. Now Pharmacist’s knowledge furosemide doesn’t help with heart murmur, just reduces work load off the heart by making dog pee a lot more. Helping slow progression of enlarged heart moving into heart failure. The reduced workload on dogs heart made dog feel better and have more energy to act more normal. The X-ray my vet used helped him to know the meds would help Pepe because he had an enlarged heart.. Pepe was very lucky and not a typical case his heart went back to normal. With furosemide and enalapril. X rays and blood tests can be expensive.However, what I have found online and then verified it to be correct in my area is that a vet in a rural area is a whole lot cheaper than one in the city I now drive 45 minutes longer to take him to the rural vet because the rural vet is 50 percent or more cheaper on almost every procedure I compared. Another dog I had was shot in the leg in the woods an amputation would have costs thousands of dollars at other vets I was unemployed and didn’t know what to do. I discovered this bit of information and asked others around and they mentioned a rural vet that vet was less than $600 for everything and he had to stay several days before and after procedure. All of it under $600. So to sum up what this long winded pharmacist said. Pepe had an X-ray and did get meds he had a murmur and an enlarged heart. The vet said the meds would improve the sleeping and not playing and running symptoms because he diagnosed an enlarged heart. Pepe never received meds just for the murmur even at stage 3 murmurs. Pepe’s meds initially was only $4. Very affordable using a local pharmacy can use Goodrx site to see what exact costs would be in your area that’s cheaper than having it filled at the vet, because people use that med to and can get at pharmacy. A rural vet may help if your on a fixed income sometimes driving further to another vet can save you lots of money. Could really Help you on a fixed income and possibly make X-ray and blood work affordable for you. If your dog gets what mine did it was X-ray then blood work and vet office fee. In a rural vets office I could get all of those for a little more of what just the city vets office fee was. I don’t know what you could do about the new symptoms a vet is probably your best source of info. I would keep a dog journal and record everything that happened while it’s fresh and present it to vet next time. Hope I was some help.